This evening I watched Bella. It is a movie shot in twenty-four days and with a cost of a measly $3 million. However, not only did it have all the trimmings of a regular feature film you would see on any given weekend but it beautifully dealt with issues of substance…and from a robustly biblical viewpoint. I won’t tell you the story of Bella, you need to see it for yourself. I mention the movie because in seeing it I was reminded about how people of faith can make significant contributions to culture that doesn’t cheaply imitate secular counterparts (e.g., much contemporary Christian music) but submits original, artistic and God-honoring creations. 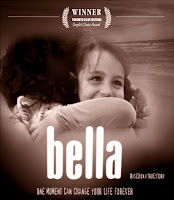 Bella even won the prestigious People’s Choice Award at the Toronto Film Festival. Not too shabby. But for as much of a gem this movie is, it lives in rarefied air. All too often some of the best movies dealing with themes (redemption, struggle, meaning, etc.) important to Followers of Jesus are created by those who, if not placing themselves on the outside of Christianity, dangerously tread its periphery. Oh what a world it might be if Christians, once again, led the way in literature, painting, drama and other spheres of art! Thanks to the creators of Bella reminding us that the arts, like everything else, can…and should bring glory to God.